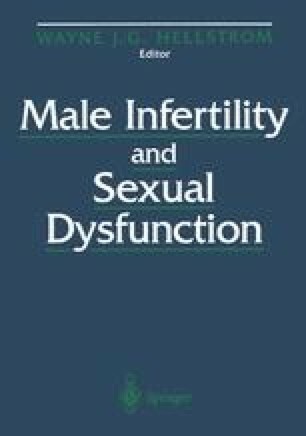 Excurrent duct obstruction is a potentially reversible cause of male infertility. It can occur anywhere along the ductal system from the rete testes (empty epididymis syndrome) to the ejaculatory ducts. The incidence of obstructive azoospermia among infertile men is approximately 7% to 10%. Elective vasectomy is the most common cause of ductal obstruction. Other causes of ductal obstruction include those related to congenital anomalies ranging from total absence of the vasa deferentia, seminal vesicles, and ejaculatory ducts to a minor dysjunction between vasa and epididymides or obstruction secondary to scarring of the tubules as a result of prior infection, inflammation, trauma, or iatrogenic injury to the epididymis or vas deferens. Figure 16.1 is an algorithm suggested for evaluating and treating patients who may have an obstructive or non-obstructive problem causing azoospermia.